Ask any rando on the street to name a popular Star Trek term and the word 'Klingon' will likely be among the first they utter. After all, the proud people of Qo'noS have had a very long and complex relationship with the men and women of Starfleet, and inspired some of the greatest and most popular sci-fi tales of all time. This week hosts Cam Smith and Tyler Orton tap into their deeply buried warrior spirits in order to examine how these iconic aliens have been reimagined time and time again in order to fit the needs and interests of the storytellers. 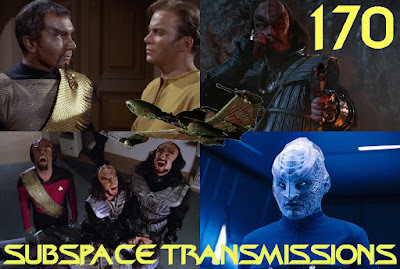 From their first appearance in the classic TOS episode Errand of Mercy, all the way up to the current day shenanigans of L'Rell, Voq and Kol in Discovery, the duo chart all the critical transition points in the Klingons' fascinating 50+ year journey. In addition, the hosts review the first issue of IDW's new Discovery comic book arc The Light of Kahless, discuss the Tarantino Trek movie news and the Ortonville takes on The Orville's 11th episode, New Dimensions. Qapla! Wanna appear on the show? Shoot us a 30 to 60-second audio clip telling us your thoughts regarding THE EVOLUTION OF THE KLINGONS and you could take the spotlight in an upcoming program! You can also send any other questions, topic ideas or feedback to subspacetransmissionspod@gmail.com! Should Tarantino Direct Star Trek? Join us next week as we hand out our Discovery mid-season report cards! #171 - IS EARLY STAR TREK EVER AWESOME?